I've watched Hustle since the first series and loved it straight away but tonight we have to say farewell as it is the last ever episode. Stacie is back to help her old grifter friends so it'll be nice to see her again (it's just a pity Danny "phwoar"* Blue won't be back as well). Although I love Hustle, I don't feel sad that it is coming to an end. 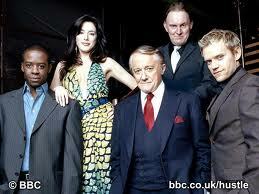 It has had a fantastic run but the latter series haven't been as good as the first ones. I still enjoyed them but it was missing something so it's better to bow out now than stretch it out until there is no magic left at all. He came back! *swoon* Only for a few minutes but it was enough. I shed a little tear at the end! Hustle has been my favourite tv show since it started! I'm gutted it's finished but I suppose it's best it went out on a high. And I'll join you in the Danny Blue Appreciation Society. He looked smokin' hot last night. I was never a big fan when he was in the show - my heart was with Mickey - but last night Danny was hot! It definitely went out on a high, bringing back the old members of the team. I loved it.